The Holiness of God became the watershed moment in my walk of sanctification. Living most of my entire life in the church, sadly, I never felt like I knew who God was until I read this book. This book changed everything, rebuilt the foundation upon which my faith stands, and is the primary reason I ended up attending and graduating from seminary. Substantive enough to provide a solid theological foundation, yet not so esoteric that the lay reader is lost. A masterwork by a master theologian. A proper picture of who we are...and who God IS. when I was akid I used to go to church a few times in one year and everytime as I entered inside the church I was afraid.I didnot know why I wasnt very comfortable there. After reading The Holiness of God I realise I had right feelings. An unrepented person at the present of A Holy God must fear to death.I wish every person who goes to church realises this and repents. Before I read the holiness of God I always had a difficult time accepting the wrathful God of the Old Testament. I prayed about this for months and asked God to help me to understand his word. After reading the sixth chapter of the holiness of God I wept in the presence of God and found peace with Gods word I never knew before. It is a must read for any college student going into ministry or philosophy, after reading the book I have not wrestled with Gods word and all that is in it. I WILL NEVER SIN AGAIN!!! ALL JOKING ASIDE, I AM LOOKING FOWARD TO SERVING A BIBLE STUDY, TO SHARE THIS BOOK WITH OTHERS BECAUSE OF THE IMPACT IT HAS HAD ON ME. 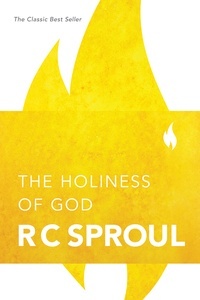 WHEN I BEGAN TO SEE THE HOLINESS OF GOD I TO WAS &quotUNDONE&quot AND COULD NOT WAIT TO CONTINUE TO READ MORE. I HAVE COME TO RELIZE THAT THE MORE I LEARN OF GOD'S HOLINESS, THE MORE I LEARN OF HIS MERCY. The first time I heard this message by RC, I was in awe with the character of God. Then, I became somewhat angry because I had never heard the message before. My question was, why aren't Pastors teaching this? Why aren't they teaching the full counsel of God? I've discovered that the answer is it will affend the sinner. Praise be to God that the Word isn't entirely eclipsed in our generation. Get this series today! When my mother died 5 years ago I took home several of the books in her library. One of those books was "The Holiness of God." I finally got around to reading it a couple of years after that and it had a profound impact on how I viewed God. Thank you for this wonderful book!